Bolt says:. Please fans, dont say آپ hate things, witch i already have, but yeah..... so, just listen to bolt and all your practical dreams will come true...maybe.. -boltlover. HD Wallpaper and background images in the Disney's Bolt club tagged: bolt dog anime screencap. What does he mean by "you"? @Volt-X-Onyx Did you miss the point of the picture? 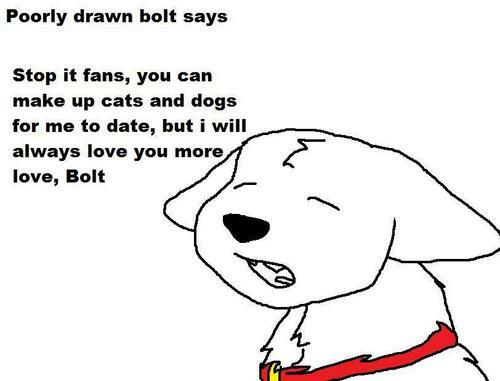 Bolt himself says you can make dogs AND CATS for him to date but he'll always love his fans the most.